According to pollsters and pundits, Christy Clark is about to become ex-premier of British Columbia in the May 2013 provincial election. The Burnaby-born politician, 47, succeeded former B.C. Liberal Party premier Gordon Campbell in 2011, when she successfully sharp-elbowed her way into the provincial Liberal Party leadership race following Campbell’s resignation after a decade in office. Clark served in the legislature from 1996-2005, and co-chaired the 2001 campaign that gave the Liberals a landslide victory and 77 of 79 legislative seats. Her tenure as a cabinet minister was rocky, to say the least. 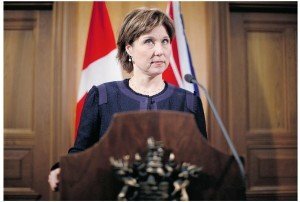 An attempt, as education minister, to ban teacher collective bargaining was eventually found to be unconstitutional, and her name was persistently linked to a long-running scandal that followed the Liberal government’s privatization of B.C. Rail. Clark temporarily retired from provincial politics in 2005. She made an unsuccessful bid to secure a nomination in the Vancover mayoral election, and then retreated to talk-show radio, the refuge of many an ex-B.C. politico. Unlike exile, hosting a talk-radio show is a close-to-the-scrum (not scum!) vantage point for politicians plotting a comeback. Her two-year run as premier has been, um, “troubled,” to put it mildly. The latest bungled plan was a murky scheme to manipulate ethnic voters to support her. As the 2013 provincial campaign neared, Clark was running 20 points behind NDP opposition leader and premier-in-waiting, Adrian Dix. An April Angus-Reid poll reported she was tied for the dubious distinction of least popular provincial leader in the country. At an April 8 fund-raising dinner co-hosted by the CEOs of Lululemon, Cactus Club restaurants, and condo marketer Bob Rennie, Clark remained undaunted, assuring supporters, “When free enterprisers have something worth fighting for, we win.” Standby for updates, leotards, and post-mortems.